Build a network within your community, while also building life skills. The Arc provides a variety of social and recreational opportunities to encourage you to get out and try something new. Discover a new hobby or interest while getting to know new people and exploring your community. 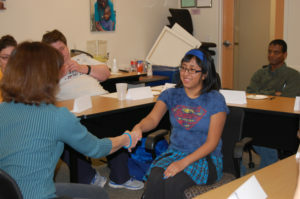 We offer many opportunities to practice the social skills and techniques you’ve learned along the way. CONNECT creates opportunities to build natural networks and positive experiences through a range of individualized and community supports. CONNECT services facilitate successful transitions to adulthood and maximize independence. Life coaching allows individuals to discover their strengths and abilities, while establishing an actionable plan and learning accountability techniques that will enable you to achieve personal success. CONNECT is a program at the St. Louis Arc that empowers individuals to lead an independent life using individualized and community supports. This program is ideal for adults interested in moving out on their own and needing minimal support in order to be successful. For the next meetup dates and to RSVP, join our Meetup group. For more information, please contact Beth Moeller, Director of Community Living at 314-817-2271. If you are ready to take the next step to meet new people on your own, the St. Louis Arc offers a wide array of sports and leisure activities. These classes, activities, and sports leagues provide people of all abilities the opportunity to stay active, meet new people, and have fun.